In the future we might print not only buildings, but entire urban sections_3d Printing Latest News_Shenzhen Affinity 3D Printers Intelligence Technology Co., Ltd.
Forward-thinking designers are using 3D printing to blow architecture wide open, as Dezeen's editor-in-chief Marcus Fairs reports in this extract from Print Shift, our one-off publication dedicated to the developing technology. The race to build the first 3D-printed house has begun. Teams of architects in London and Amsterdam are competing to produce the first habitable printed structure, using technology that could transform the way buildings are made. Though they all have the same objective, the teams are investigating very different materials and fabrication methods. 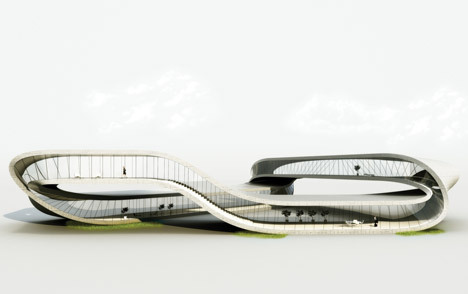 The starting pistol was fired by Dutch studio Universe Architecture, who, in January of this year, unveiled designs for a looping two-storey house that resembles a Möbius strip and will be printed on site, in concrete. 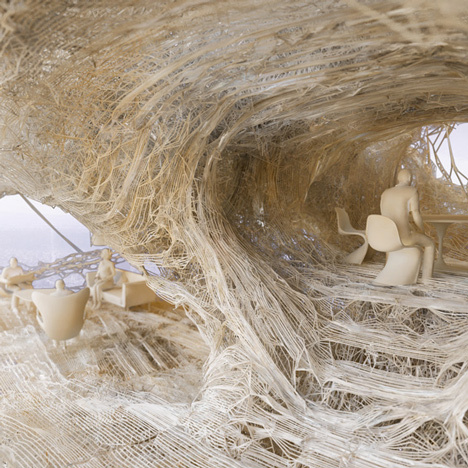 Shortly after, UK architects Softkill Design announced plans for Protohouse 2.0, a single-storey dwelling with a fibrous structure resembling bone growth. It will be made of plastic and printed in a factory, in sections that are then snapped together on site. Then DUS Architects, also based in Amsterdam, went public with a project to print, room by room, a canal house in the city, using a homemade portable printer located inside an upended shipping container. In addition, a research team at MIT in the US is working on plans to print a small pavilion fashioned by a robotic arm imitating the manner in which a silkworm builds its cocoon. All these approaches are completely untried at this scale. And there's a certain amount of scepticism regarding the viability of scaling up a technology that, until now, has only been used to make relatively small objects – objects that do not demand the structural or environmental performance of a house. But architects working in this area are convinced it won’t be long before additive manufacturing transforms their discipline. "When we started our research, we were dealing in science fiction," says Gilles Retsin of Softkill Design. "Everyone on the architecture scene was saying, 'It’s only going to be possible in 50 or 60 years.' But when we were sitting at the table in front of one of these 3D-printing companies, these guys were like, 'Yeah, no problem – let's start up the research, let's push it.' So it's not actually that far off any more." Neri Oxman, architect and founder of the Mediated Matter group at the MIT Media Lab, argues that digital fabrication is ushering in a third era of construction technology. "Prior to the industrial revolution, hand-production methods were abundant," she says. "Craft defined everything. The craftsman had an almost phenomenological knowledge of materials and intuited how to vary their properties according to their structural and environmental characteristics." But the coming of the industrial revolution saw the triumph of the machine over the hand. "The machine was used to standardise everything. And the things we built – our products, our buildings – were defined by these industrial standards." Now, however, digital technologies such as additive manufacturing allow craft and industry to merge. "Craft meets the machine in rapid fabrication," says Oxman. "We can generate craft with the help of technology." The question is, which technologies are best suited to architecture? The results of the above architectural experiments will go some way towards answering that. 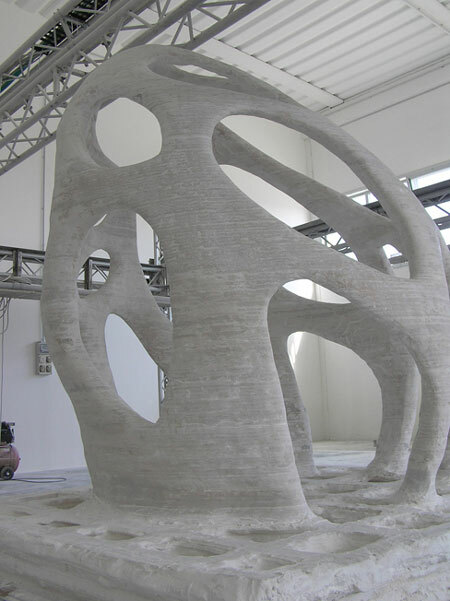 Universe Architecture is collaborating on its Landscape House with Italian robotics engineer Enrico Dini, inventor of an extremely large-format 3D printer that uses sand and a chemical binding agent to create a stone-like material. Dini's machine, called D-Shape, is the largest 3D printer in the world. Located in a warehouse near Pisa, it looks like a stage-lighting rig and works like a laser-sintering machine, but with sand instead of nylon powder, and chemicals instead of a laser. A moving horizontal gantry first deposits a 5mm substrate layer of sand mixed with magnesium oxide, then, via a row of nozzles, squirts chlorine onto the areas of sand that are to become solid. This resulting chemical reaction creates synthetic sandstone. The gantry is then raised, another layer of sand is added and the process is repeated. When the D-Shape has completed its printing, the surplus sand is carefully removed to reveal the solid object underneath. D-Shape prints at a rate of 5cm per hour over a 30-square-metre area, to a depth of up to two metres. Working flat-out, it can produce 30 cubic metres of building structure per week. Dini is a pioneer in the field and the only person to have already printed prototype structures at an architectural scale. In 2009 he worked with architect Andrea Morgante to print a three-metre-high pavilion resembling a giant egg with large holes in its surface. Fabricated in sections and then assembled, it was intended as a scale model of a 10-metre structure that was never built; nonetheless, it can stake a claim to being the first-ever printed architectural structure. Dini worked with designer Marco Ferreri in 2010 to create the first dwelling to be printed in one piece. The resulting "house" – a one-room structure resembling a mountain hut – was printed for an exhibition at the Triennale in Milan. The crude building had a doorway and two square windows; its interior featured a work surface, sink and platform bed. "It's a very historical piece," says Dini. "It was the first attempt to print a building." Unfortunately, the brittle synthetic stone cracked during transportation, leading Dini to decide that fabricating buildings by section was a more viable use for his technology. Printing buildings in one go will be possible in the future, says Dini, "but probably not with my technology." Instead, he now sees a role for D-Shape in printing building elements like large façade panels, large diameter columns and double-curvature components. Machines such as D-Shape could eventually be adapted to work on the move, Dini adds, allowing them to print on an urban scale. "We might print not only buildings, but entire urban sections," he says. For Universe Architecture's Landscape House, Dini has devised a system that will see two D-Shape printers working side by side inside temporary structures close to the site. The D-Shapes will print a kit of parts that will be assembled to form the looping structure. Each part will be hollow; the superstructure will be filled with fibre-reinforced concrete to give it structural integrity. "Before our Landscape House design, you could easily use the printer to print vertical columns," says Janjaap Ruijssenaars of Universe Architecture, "but it was not possible to print something that has a horizontal connection, like a beam. By putting reinforced concrete within a hollow structure, you can have a vertical load on top of a horizontal structure. And that opens the door for all types of designs. It was Enrico Dini's idea." Because of the fragility of the individual parts, they'll have to be printed with support structures to prevent them from breaking while they're manoeuvred into position; these will be removed after the concrete filling has been poured in. The entire process will take up to a year and cost around €5 million. Universe Architecture doesn't yet have a client willing to put up that kind of money. Some purists argue that this convoluted process is not "true" 3D-printing. "We actually don't consider that a 3D-printed building," says Softkill Design's Gilles Retsin, "because they’re 3D-printing formwork, then pouring concrete into the form. So it's not that the actual building is 3D-printed." For its Protohouse 2.0, Softkill Design plans to print the entire building using industrial laser-sintering machines normally used to make prototypes for the automobile industry. "The existing research always focuses on transporting a 3D printer to the site because they're using sand or concrete," says Retsin. "We're deliberately working in a factory and using laser-sintered bioplastic [plastics derived from biomass rather than hydrocarbons]." The design itself also bucks convention: instead of columns and floorplates, it has a fibrous structure akin to the trabecular composition of bone. Unlike sand-based structures, which require thick sections to maintain structural integrity, Retsin says these fibres can be as thin as 0.7mm. This opens up all sorts of new aesthetic possibilities. Traditional steel or concrete structures have a high level of redundancy – material that doesn't need to be there, but which is too difficult or expensive to remove. But 3D printing allows material to be placed only where it is required. "We created an algorithm that mimics bone growth, so that we're depositing material only where it's necessary and most structurally efficient," says Softkill Design's Aaron Silver. "It's not a purely structural object; we've also tried to 'design' with it, to create our own forms." The single-storey house has a porous exoskeleton rather than a solid envelope. Weatherproofing would be applied inside, lining the cave-like living spaces. Voids would be glazed in the traditional manner. The building will have a footprint of around 8 by 5 metres and will be laser-sintered in a factory, in pieces. These pieces, each up to 2.5 metres, will be transported by van to the site (although, like Universe Architecture, Softkill Design doesn't have a specific site or client yet) and joined simply by pushing together the fibrous strands "like Velcro". Softkill Design believes the pieces could all be printed in three weeks and assembled on site in a single day. "The big difference between 3D printing and manufacturing on site is that you're almost entirely skipping the fabrication part," says Retsin. There are huge potential time, labour and transportation savings to be made, compared to traditional construction methods – however, the cost of 3D-printed materials is still far higher than regular bricks and blocks. "The price of 3D printing is still a big problem for large volumes," says Retsin. "You pay for the amount of material used rather than the volume. So we've developed a method that can generate a large volume with extremely thin and porous structures. It's only now with 3D printing that you can achieve a strong, fibrous structure using less material than a normal structure. That makes it cheaper." 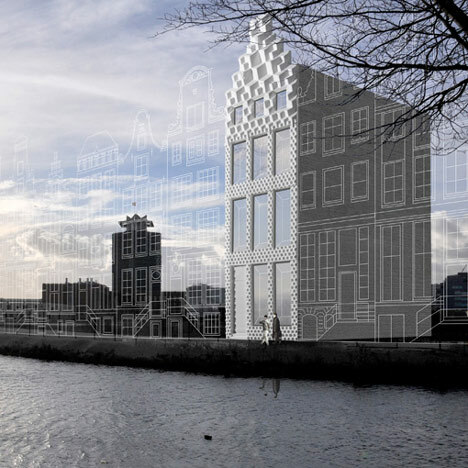 For its canal house project, DUS Architects is using lower technology: a scaled-up Ultimaker desktop machine that it calls the KamerMaker ("room maker") that can print components up to 3.5 metres high. Working initially in polypropylene, the architects hope to experiment with recycled plastics and bioplastics further into the build. The project is not about exploring new architectural possibilities but rather generating discussion about the future of design and construction. Starting on site this summer, DUS intends to figure out the construction methodology as it goes along and hold workshops and open days in the structure as it is built. "3D printing is not going to replace brick and concrete buildings. I think it's more going to be the case that we'll start printing brick and concrete," says architect Hedwig Heinsman of DUS. "This is something to kick-start a debate about where architects will be in the future." Over in Cambridge, Massachusetts, the Mediated Matter group at MIT is researching a head-spinning array of innovative design and construction processes that integrate, as their website states, "computational form-finding strategies with biologically inspired fabrication". Many of these involve looking at ways of developing 3D-printing technologies for architectural applications. "The 3D-printing technology has been developing at a very rapid pace," says Mediated Matter founder Neri Oxman, "but there are still many limitations," such as the range of materials you can use, the maximum size you can print at and the speed of the process. Oxman and her team are researching ways of getting around such drawbacks, for example experimenting with printers that can produce "functionally graded" materials that exhibit a range of different properties. Existing 3D printers are only able to produce homogeneous materials that have the same properties throughout. But graded materials would be useful for printing architectural elements – such as beams or façades that mimic bone, which is hard on the outside but spongy on the inside. Or for printing human skin, which has differently sized pores on different parts of the body, allowing it to act as a filter on the face and a protective barrier on the back. Oxman has developed a process to assign different materials or properties to individual voxels (volumetric pixels) produced on existing printers, creating simple graded materials. But gradients are hard to produce with the current generation of 3D printers, which rely on armatures or gantries that can only move on three axes – back and forward, side to side, and up and down – and which must lay down material in layers, one atop the other. They also require complex support structures to be printed at the same time to prevent the printed objects collapsing under their own weight. "In traditional 3D printing, the gantry size poses an obvious limitation for the designer who wishes to print in larger scales and achieve structural and material complexity," explains Oxman. She and her team are investigating ways of printing with additional axes of movement, by replacing the gantry with a six-axis robotic arm. "Once we place a 3D-printing head on a robotic arm, we free up these limitations almost instantly," she says. This is because it allows "free-form" printing at a larger scale and without the need for support structures. Oxman and her team have been looking to the natural world for inspiration, studying the way in which silkworms build their cocoons. Silkworms "print" their pupal casings by moving their heads in a figure-of-eight pattern, depositing silk fibre and sericin matrix around themselves as they go. They're able to vary the gradient of the printed material, making the cocoon soft on the inside and hard on the outside. As well as the silk fibre – which can be up to a kilometre in length – the pupae also excretes sericin, a sticky gum that bonds the fibres together to form the cocoon. Essentially, the silkworm is acting as a multi-axis 3D multi-material printer. "We attached tiny magnets to a silkworm's head," says Oxman, "and we motion-tracked its movement as it built its cocoon. We then translated the data to a 3D printer connected to a robotic arm, which would allow us to examine the biological structure in a larger scale." Oxman's team will perform its first large-scale experiment using this research in April, when it aims to print a pavilion-like structure, measuring 3.6 by 3.6 metres, using a robot programmed to act like a silkworm. Robotic arms can be used to print in traditional materials, such as plastic, concrete or composites, or employed to weave or knit three-dimensional fibre structures. Researchers are also exploring how the high-performance fibres excreted by silkworms and spiders could be produced artificially, and Oxman's team will print the pavilion's structure using natural silk. In the future, buildings may be constructed by swarms of tiny robots that use a combination of printing and weaving techniques, Oxman says. 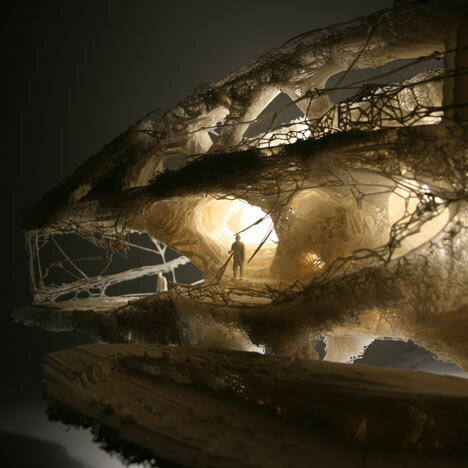 "I would argue that 3D printing is more than anything an approach for organising material," she says, using the terms "4D printing", "swarm construction" and "CNC weaving" to describe the future of architectural technology. "Today’s material limitations can be overcome by printing with responsive materials," she says. "Gantry limitations can be overcome by printing with multiple interactive robot-printers. And process limitations can be overcome by moving from layering to weaving in 3D space, using a robotic arm." According to this vision, the construction site of the future will owe more to tiny creatures like silkworms than to ever-larger 3D printers of the type we use today. "Transcending the scale limitation by using larger gantries can only offer so much," says Oxman. "But if we consider swarm construction, we are truly pushing building technology into the 21st century."